Do you want brilliant results evrytime you print? Epson offers a wide range of inks to suit a variety of printing applications – whether you're a home, business or professional user. With it's unparalleled color range and print performance, Epson never disappoints. Epson UltraChrome 80 ml Photo Black. For use in Epson SureColor P800 printers. Epson UltraChrome 80 ml Cyan. For use in Epson SureColor P800 printers. Epson UltraChrome 80 ml Vivid Magenta. For use in Epson SureColor P800 printers. 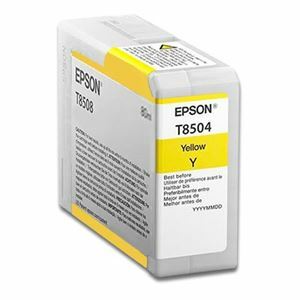 Epson UltraChrome 80 ml Yellow. For use in Epson SureColor P800 printers. Epson UltraChrome 80 ml Light Cyan. For use in Epson SureColor P800 printers. Epson UltraChrome 80 ml Vivid Light Magenta. For use in Epson SureColor P800 printers. Epson UltraChrome 80 ml Light Black. For use in Epson SureColor P800 printers. Epson UltraChrome 80 ml Matte Black. For use in Epson SureColor P800 printers. Epson UltraChrome 80 ml Light Light Black. For use in Epson SureColor P800 printers. Epson UltraChrome Ink 110 ml Yellow. For use in Epson Stylus Pro 4000/7600/9600 printers. 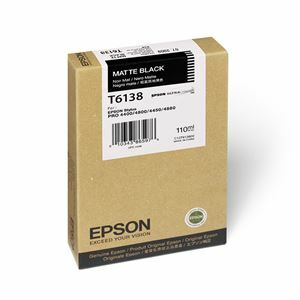 Epson UltraChrome Ink 110 ml Matte Black. For use in Epson Stylus Pro 4000/7600/9600/4800/4880 printers. Epson UltraChrome Ink 220 ml Photo Black. For use in Epson Stylus Pro 4000/7600/9600 printers. Epson UltraChrome Ink 220 ml Cyan. For use in Epson Stylus Pro 4000/7600/9600 printers. Epson UltraChrome Ink 220 ml Magenta. For use in Epson Stylus Pro 4000/7600/9600 printers. Epson UltraChrome Ink 220 ml Yellow. For use in Epson Stylus Pro 4000/7600/9600 printers.